As of Q1 2018, These are the manufacturers of WFE systems currently on the market and used in our industry. This list will be updated periodically. Please feel free to contribute any of your experiences with these machines. The list descends in cost from 1- 4 and each links to a manufacturer webpage. The VTA is number one on the list because of a few things. First being quality and design. It is also the most expensive at 150k on up. The unit is manufactured in Germany and has excellent US customer support. The units are installed by a US installer who is well known in the cannabis community, which was an excellent choice for VTA. He also conducts the training, and is probably the most knowledgeable WFE operator I know. Unlike any other of the companies I’ll list - VTA actually has working factual data based off cannabis oleoresin itself. Currently VTA is sold in the US under the Root Sciences brand. The VTA has a fully jacketed oleoresin path and the most advanced WF cold trap on the market. (As far as cold traps go, BRinstruments takes that award IMHO). For distillate and waste: The system uses either standard, under vacuum flasks; or jacketed spouts. 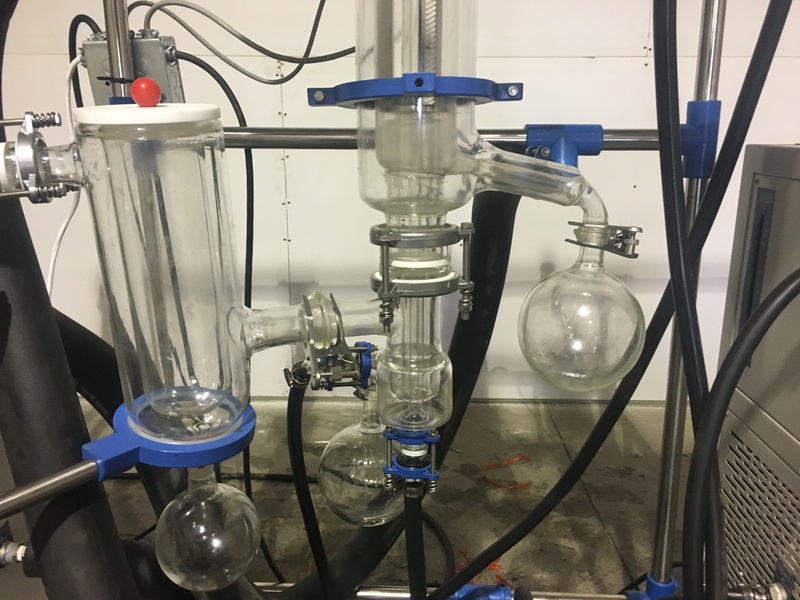 This system relies heavily on the most advanced of liquid pumps to move the warm oleoresin, which is probably why it is open-ended. 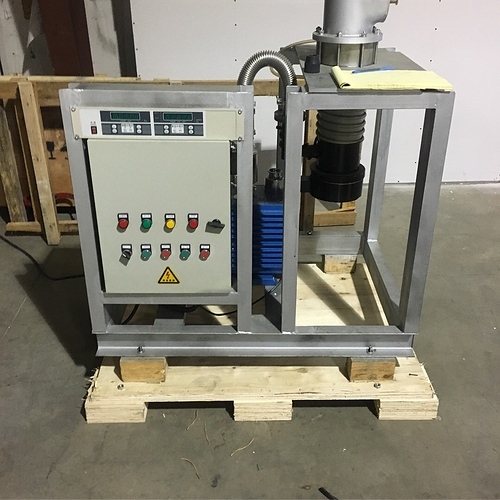 These particular pumps at waste and distillate end - are called discharge pumps. VTA offers their systems in glass which is created in-house; and stainless. They also offer the capability to connect multiple machines for daisy-chain style, mutistage processing. 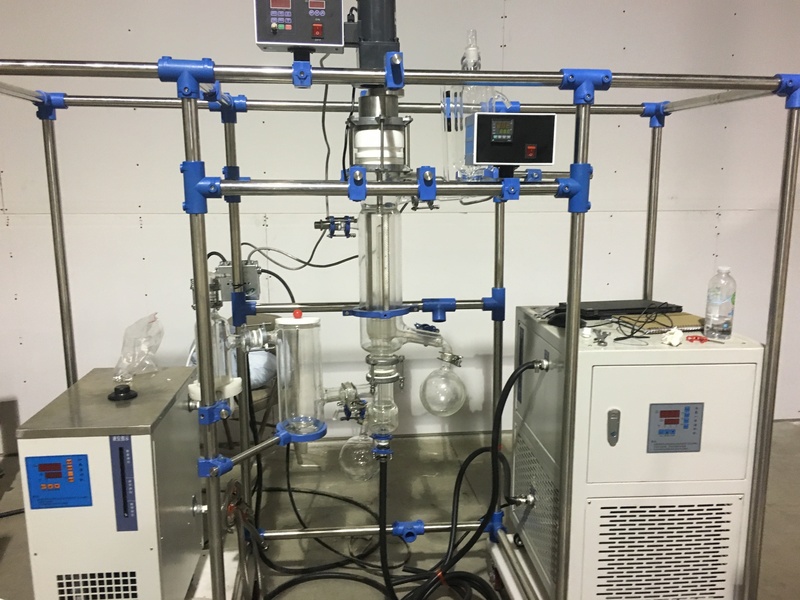 Pope and Helderpad offer competitively priced stills; Pope from 2" - 6". Chemtech offers a 6" still body on their two KDT and KDL series models (as of 12/17). Their stills are made here in the US. Both companies offer glass or stainless versions, as well as multistage. The advantage to these systems vary. The Pope offers entry level WFE packages and have been in the cannabis market longer. They offer more scalability if you want to start small (35k), and are flexible with builds. While the 2" Pope is still the little guy on the block; I’ve had them outputting 1kg a day of D9 with ease. Helderpad has a fully jacketed oleoresin path, competitive price point (starting at 65k) for the evaporative surface being offered, and they offer on site training. Asahi is a Japanese glass plant; which produces very high end, fully jacketed glass WFE stills- distributed by AGI. I have not used; but always marvel at it’s design. If anyone has any input on these it would be most welcomed:) EDIT: See below for upcoming info on the AGI WFE models…Thanks Future4200! what about there vacuum pumps? do they all have turbomolecular pumps or do some just have diffusion pumps? Good question. Each manufacturer offers a vacuum solution; most are with Edwards or Agilent. VTA utilizes Leybold vacuum pumps for roughing, and diffusion pumps for backing. They are currently testing with TM as well. Most of the Helderpad systems come with a diffusion or TM pump, and Popes can be configured to have them as well. I prefer an Edwards 28/30 or Dry Scroll pump if carefully matched with WF systems. Cacejen is also a viable route for both wet and dry pumps. The AGI wfe is made in Japan and Switzerland. They have several models. I’ll post some info from their data sheet. Great post idea! I have worked with Asahi’s since 2015 and can testify to their glass quality and mechanical design of the wiper assembly(swiss) With the right setup, you can run circles around a VTA. Heaters, vac system and dosing control are important for max thruput. Excellent thread! Thanks to Future for taking the time to put together this wonderful forum and thanks for the idea OP! It’s cool that we are finally at a time where we can brainstorm and compare systems like this widely available for cannabis. Just over a year ago this information was “secret” and I was told to “die a rat’s death” for revealing the “secret” of a Youtube video of a Root Sciences VTA to a new company I had joined and convincing them to purchase one. Sweet memories. Anyhow, I would love to hear reviews of the Asahi glass. I’ve had it on my radar for a while and it seems like a great little system to do both R&D and production with, -if you have experience. Any info on the entry level price for just the glass setup on an Asahi wiped film short path vs complete with chillers/heaters? Side question: Degassing space, does it matter? 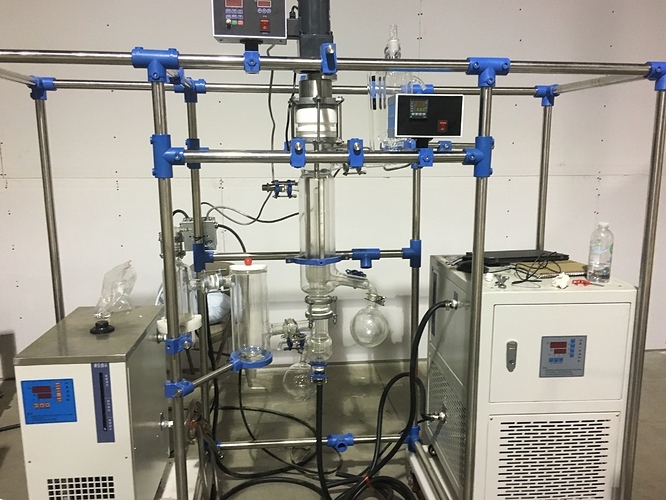 The VTA has a “degassing arm” that is maybe 35mL of space before the liquid drops into the evaporator, the small chemtech I saw doesn’t have this, I was wondering how much it would matter? Other systems have this as part of the feed? It would be better to have the whole feed tank degas, but obviously there are practical considerations. I’m very interested in hearing opinions on the root sciences vs the pope. Those would be my top 2 choices. Anyone with experience on the versatility of products you can produce, as well as ease of use, and cleaning for these 2 machines would be much appreciated. I asked around for some info about Asahi a while back and the consensus I got was that they had decent equipment. However I have not heard good things about Genius, one of their distributors. My personal interaction with them at an expo about a year ago was not so favorable either. Personal bias aside I’m still interested in how the equipment performs. 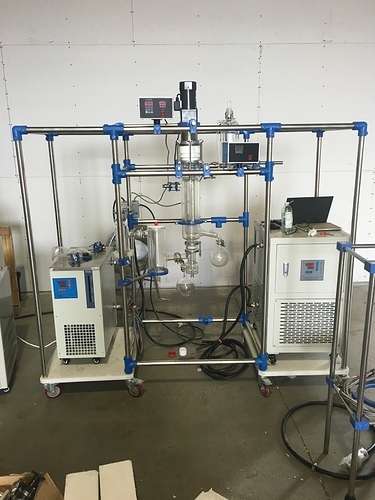 Asahi brought a demo unit to Cannacon to display in our booth. The response was very good. I wouldn’t be surprised if we were taking pre-orders in May for release in June. For now, there are a lot of unknowns. I imagine that a company like Cascade will want premium ancillaries like Heidolph Sitrrers, Welch/Agilent pumps and European chillers. I also imagine that we will come in thousands less than the competition with units in stock and ready to ship. Then again, I am a very imaginative person. How do these four compare to the no-name systems one can find? What about the Chinese system @EndlessOps is currently unboxing? has anyone else picked up their WFE from Alibaba? I gotta say I’m super happy with the quality of the system I honesty think thisbshits all over the pope. The glass is thicker (we upgraded) I have a 10l feeding flask instead of the normal 2 or 3l. And it’s s true continues sysem. Pics and videos will be added very very soon. The pope runs 65kish I can have the 6inch 150mm same design I have dropped st your door step for 55k with in 4 weeks or less and have full warranty. Everyone complains about the turn around time with Asia but I have had no issue when using a agent there. I have the KDL5-Mini from Chemtech. It works extremely well. Around 700g/hr. I have fed it with 1 year old 60-70% THC -20 wash ethanol oil with no post extraction winterization and have been getting 85-95% single pass. Only issue with running this non-winterized is the build-up of fat/wax material on the evaporator, which sometimes gets thrown off into the distillate receiver (looks like carbon). ChemTech is great to work with. Any monkey can run their machines. I have been trying to get my hands on a mini to play with! I know a thing or two about wiped film, and wanted to see if I could get good results tuning up a small rig. Sounds like you nailed it! That’s your feed rate? 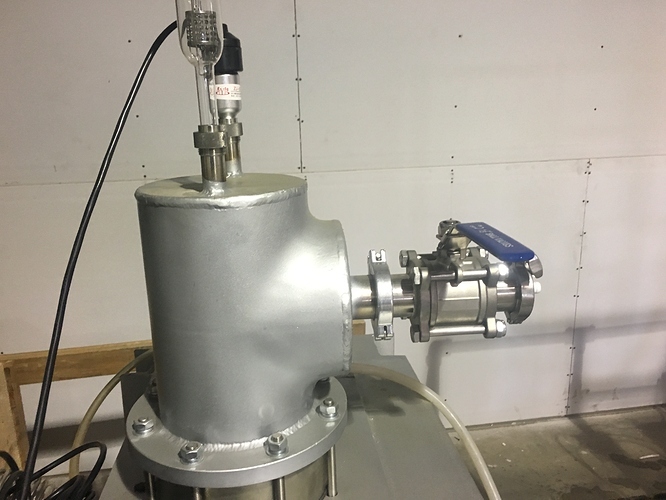 If you are only doing a single pass, I’m guessing you are removing all the lower boiling point volatiles in your decarb step? I have noticed the same thing with unwinterized material, you can still get high potency distillate, but it gums up evaporator walls. Cleans off with polar solvent better than non-polar. 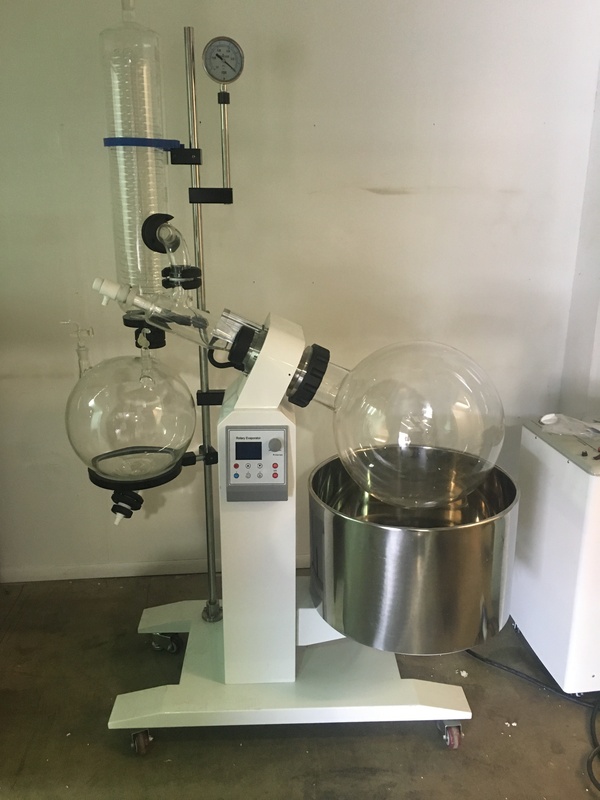 700g/hr is distillate amount, not feed. Most of the terpenes/ volatiles come off in decarb. I replaced the regular evaporator with a KDL-6 evaporator, it’s still glass but has jacketed residue and distillate collector. I also run a KDT-6 that works well. The stainless steel evaporator is better as far as heat transfer goes. But I love to see the wipe happening, and if there is an issue somehow and the wipers get jammed you aren’t going to do major damage by continuing to run. Those look like they do the job. Waste side has an interesting design, so does the cold trap. Let us know how it works! What is this one?!? Just the Vacuum pump? ?